This is a quick test to get a rough idea what snow covering part of a PV panel has on power output. I cleared the snow off half the panels on my array, and left the other half as they were (about half covered with snow). While its clear that having snow on your PV panels can't be helping the power output, I thought that with a situation as in the picture where only about half the panel is covered with a relatively thin layer of snow, that enough light might be getting through the snow to allow these panels to perform fairly well even with the snow. Not so in this case. The panels to the left with no snow are producing nearly ten times a much power as the panels on the right with the partial snow coverage -- details below. This is under what I would call mostly cloudy conditions, the difference would probably be quite a bit greater under full sun conditions. 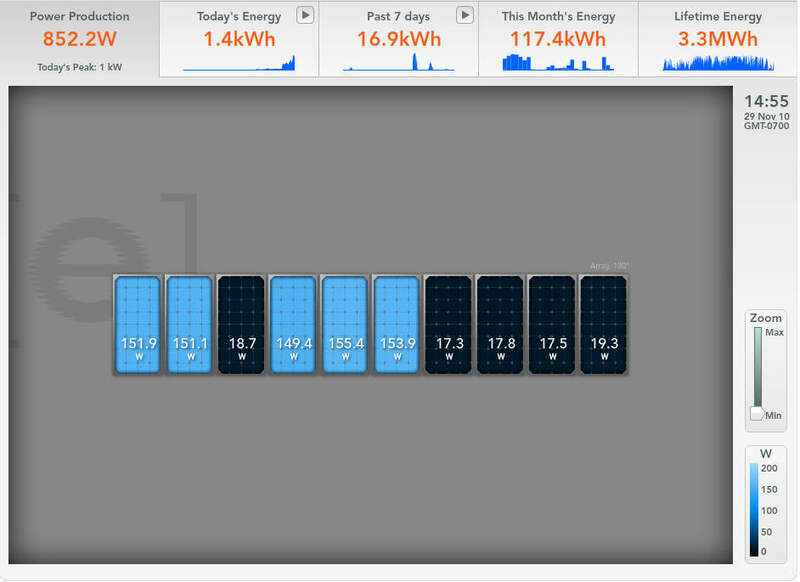 I cleared the snow off the left 5 PV panels, and left it on the right 5 panels to see the effect of the snow on power output. These were the sky conditions for during the test period. The two reports below show power output by panel for before the snow was cleared, and then for after clearing snow from the left 5 panels. 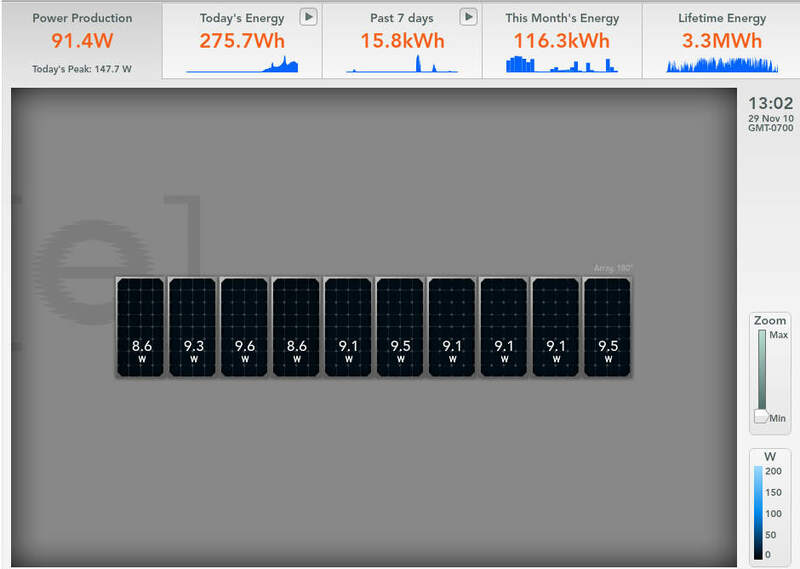 My array uses an Enphase micro inverter on each PV panel, so its possible to get panel by panel output via the Enphase online reporting system. The micro inverters also allow the 5 panels with the snow cleared off to produce full power while the others produce little power. This is the Enphase online display by panel before clearing the snow off the left 5 panels. 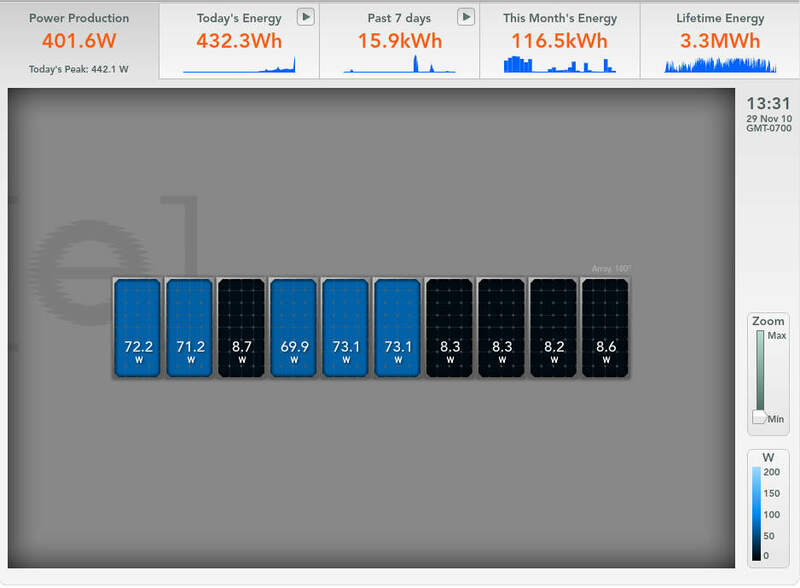 A few minutes after clearing the snow off half the panels, the online Enphase online reporting shows this. The panels that are about half covered with snow are producing about 8 watts each, and the cleaned off panels that just have a little ice on them here and there are producing about 71 watts each. I suppose this is not unexpected given that a little shading can dramatically effect a panels output, but I thought that enough light might be getting through the snow to avoid the dramatic reduction -- apparently not. It seems likely that under full sun conditions that the 71 watt panels would be up near 190 watts -- not sure what the 8 watt panels would be. I'll do this again when we get full sun. Note: Apparently either me or Enphase made a mistake on the PV panel layout, because the 3rd panel from the left is misplaced -- it should be one of the right 5 panels with the snow on it. I'll have to submit a corrected panel map to them. So, I guess the message is to get out there and clear you panels off after it snows -- something I'm sure you already knew. Here is an interesting video on snow on PV panels... Thanks to Erik for suggesting this. This is a report from somewhat later with more sun.